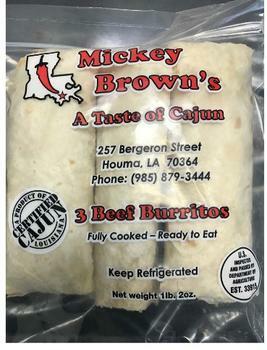 Mickey Brown, Inc., of Houma, La., is recalling an undetermined amount of beef burritos. The recalled products bearing establishment number “EST. 33915” inside the USDA mark of inspection, may be frozen and are labeled “Keep Refrigerated.” There is no “best by” or “use by” date. These items were shipped to distributors in Louisiana, which then distributed them for further retail and internet sales. Consumers with questions may contact Marshall Brown III at (985) 856-3883.